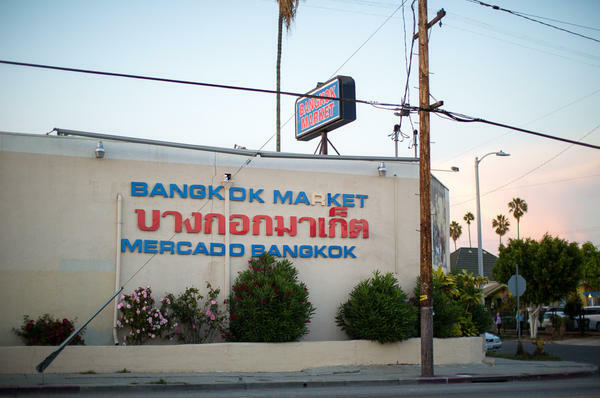 The renowned Bangkok Market, located in Los Angeles, is a longtime supermarket for retail and wholesale Thai produce, spices, chili pastes and household products. Opened in 1972, Bangkok Market was the first Thai food grocer in Los Angeles. It became a de facto community center and a magnet for both Asian immigrants and chefs looking for rare ingredients. Bangkok Market sells ingredients from around the world. That variety draws all sorts of shoppers to the market: Asians, Latinos, hipsters and exciting new chefs. Duck eggs from China for sale at the Bangkok Market. Chef Louis Tikaram said he "walked down the aisles and I knew I could get everything." Los Angeles is home to the largest Thai community outside of Thailand. This week, Thai-Americans are celebrating the traditional three-day water festival called Songkran to mark the new year. And many of them regularly shop at LA's landmark Bangkok Market, the first Thai food store in the U.S. Here, you can buy temple bells and alms bowls for monks. But there's so much more. 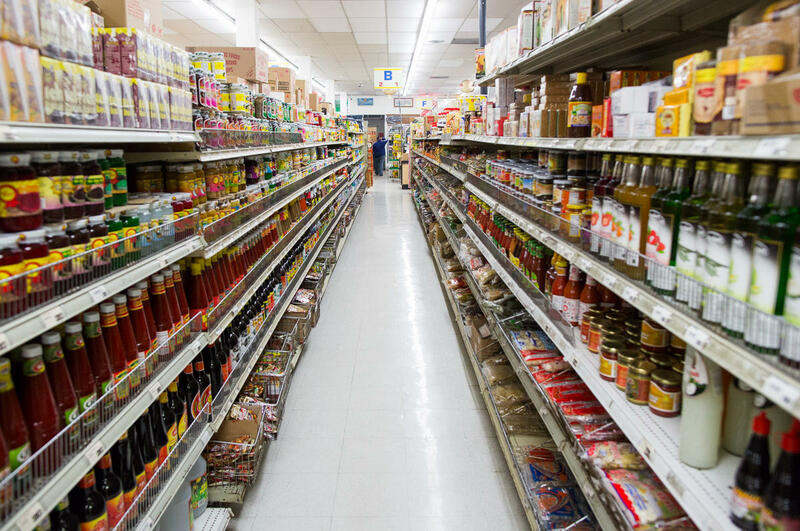 The aisles are stocked with rows of fresh Asian produce, noodles and fish sauce. There are coconut milks, curries and sriracha imported from Si Racha, Thailand. And there are astonishing varieties of rice: brown, black, purple, jasmine, even so-called "forbidden" rice — forbidden, explains chef Jet Tila, "because only the royalty in Asia could eat it." At Bangkok Market, you can buy a 5-pound bag of it for $4. Tila shows us around the market he grew up working in, before he became a top chef. For four decades, his family's store has sold inexpensive ingredients that are key to Thai cuisine. He says many of California's best chefs have shopped there. "This was the only place where they could get lemon grass, kaffir lime leaves, curry paste, fish sauce, where they weren't getting gouged for it," he explains. "They knew their suppliers. And when I became a fine-dining chef, that was my in. Everyone was like, 'Oh, you're the kid who used to pack my groceries and deliver stuff to my restaurant.' "
Tila's parents opened Bangkok Market in 1972, having moved to Los Angeles with a wave of Thai immigrants in the 1960s. "Usually we shopped at Chinatown, but they didn't have the ingredients the way Thais cook, " says Tila's mother, Marasri Tilakamonkul. "My husband saw the opportunity, so he decided that we should open the market right now." Bangkok Market soon became a de facto community center and a trading post. In the early days, before they began importing items, the family asked friends immigrating here to bring cases of curry paste and fish sauce. They relied on California farms for produce that was only available in the spring and summer. Tila says his family began growing vegetables themselves in the warmer climate of Mexico. "It was specifically two regions: Nayarit and Sinaloa," says Tila. 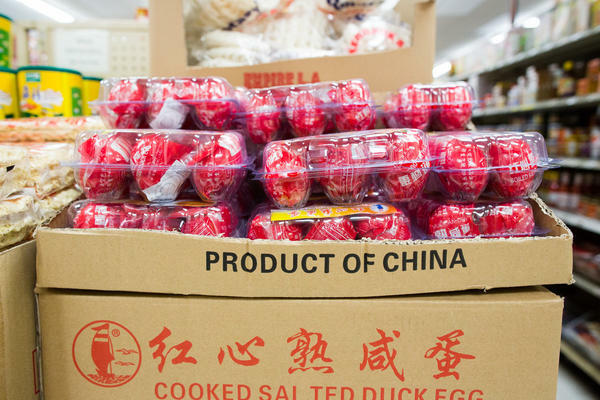 "To this day, a majority of your Asian produce in the winter come from there. And nobody knows this. My dad literally hand-carried seed — I don't know how legal it was back in the day. But, uh ..."
Bangkok Market is in a windowless beige building in East Hollywood, an area once home to rival street gangs. Tila says that though the gangs all tried to claim territory, they left the market alone "because they shopped here, and their moms shopped here." Tila says the market has survived where others did not. In April 1992, when he was a senior in high school, "The riots popped off. About 30 of us stayed here for three days straight — barricaded the doors with rice sacks, jumped on the roof with whatever guns we could bring just to defend our store." Today, to get ingredients from around the world, all sorts of people shop at the market: Asians, Latinos, hipsters and exciting new chefs like Louis Tikaram — a Fijian-Chinese-Indian-Australian who moved here to open the hot new restaurant EP/LP. Tikaram makes Southeast Asian dishes, with ingredients he buys at the Bangkok Market. "I walked in the door, and the intoxicating smell hit me of all the beautiful produce," Tikaram says. "And [I] walked down the aisles and I knew I could get everything: All of my jasmine rice from Thailand, yellow bean paste, palm sugar ... it was the saving grace of this restaurant. So you can thank Bangkok Market." Like Tikaram's intriguing menus, Bangkok Market has come to represent some of the most diverse flavors of Los Angeles. Los Angeles is home to one of the largest Thai communities in the world. And today, Thai-Angelenos began celebrating a water festival, called Songkran, to mark the new year. Many of them will be shopping at Bangkok Market, the first Thai market in the U.S. NPR's Mandalit del Barco paid a visit. MANDALIT DEL BARCO, BYLINE: At the Bangkok market, you can buy temple bells and bowls for offerings for monks and so much more. The aisles are stocked with rows of fresh Asian produce, noodles and fish sauce. There are coconut milks, curries and imported sriracha. Varieties of rice, brown black, purple, Jasmine - even a so-called forbidden rice. JET TILA: Because only the royalty in Asia could ever eat it. DEL BARCO: And you can get it here for how much? TILA: You get a 5-pound bag for, like, four bucks. DEL BARCO: Jet Tila shows us around the market where he grew up working before becoming a top chef. For four decades, his family's store has sold inexpensive ingredients key to Thai cuisine. He says many of California's best chefs have shopped there. TILA: This was the only place where they could get lemongrass, kaffir lime leaf, curry paste, fish sauce, where they weren't getting gouged for it, A. B, they knew their suppliers. When I became a fine-dinning chef, that was my in. Everyone was like, oh, you're the kid who used to pack my groceries and deliver my stuff to my restaurant. DEL BARCO: Tila's parents opened Bangkok Market in 1972. His mother, Marasri Tila Kamonkul, says they moved to LA with the first wave of Thai immigrants in the 1960s. MARASRI KAMONKUL: Usually, we shop at Chinatown. So they don't have ingredients that the way Thai cook. So my husband saw the opportunity, so he decide that, oh, we should open a market right now. DEL BARCO: Bangkok Market soon became a de facto community center and a trading post. In the early days, before they began importing items, the family asked friends immigrating here to bring cases of curry paste and fish sauce. They relied on California farms for produce that was only available in the spring and summer. Tila says his family began growing vegetables themselves in the warmer climates of Mexico. DEL BARCO: Bangkok Market is in a windowless beige building in East Hollywood, an area once home to rival street gangs. TILA: They were all trying to claim territory. DEL BARCO: But they left your market alone. TILA: Yep, 'cause they shopped here. Their moms shopped here. DEL BARCO: Tila says the market has survived where others did not. TILA: So April, '92, I was a senior in high school. The riots popped off. About 30 of us stayed here for three days straight, barricaded the doors with rice sacks, jumped on the roof with whatever guns we could bring just to defend our store. DEL BARCO: Today, to get ingredients from around the world, all sorts of people shop at the market - Asians, Latinos, hipsters and exciting new chefs, like Louis Tikaram, a Fijian-Chinese-Indian-Australian who moved here to open a hot new restaurant EP/LP. Tikaram chops lemongrass and other ingredients to make Southeast Asian dishes with ingredients he buys at the Bangkok Market. LOUIS TIKARAM: I walked in the doors, and that intoxicating smell kind of hit me of all the beautiful, you know, produce. And then I knew. I knew I could get everything. Jasmine rice from Thailand was there. All my sauces were there - palm sugar, rock sugar, coconut sugar. It was the saving grace of this restaurant. So you can thank Bangkok Market (laughter). DEL BARCO: Like Chef Louis' intriguing menus, Bangkok Market has come to represent some of the most diverse flavors of Los Angeles. Mandalit del Barco, NPR News. Transcript provided by NPR, Copyright NPR.